Before you open your AbanteCart store for business, you will need to install and configure a payment gateway. PayPal offers a range of payment processing services for online merchants and is a great starting point. AbanteCart supports PayPal Express Checkout, PayPal Payments Standard and PayPal Payments Pro. Head over to the PayPal website to find out which product is right for your needs and set up an account. When you first log into your AbanteCart administration dashboard, you’ll be invited to install a PayPal Extension that is required to integrate PayPal payments with your store. Under Select your payment methods, click Install PayPal to proceed. If you’ve already completed the AbanteCart Quick Start Wizard, you can install PayPal from Extensions > Payments in the left sidebar. Note that there are different PayPal extensions for PayPal Express Checkout, PayPal Payments Standard and PayPal Payments Pro. Be sure to select the correct extension for your PayPal service. 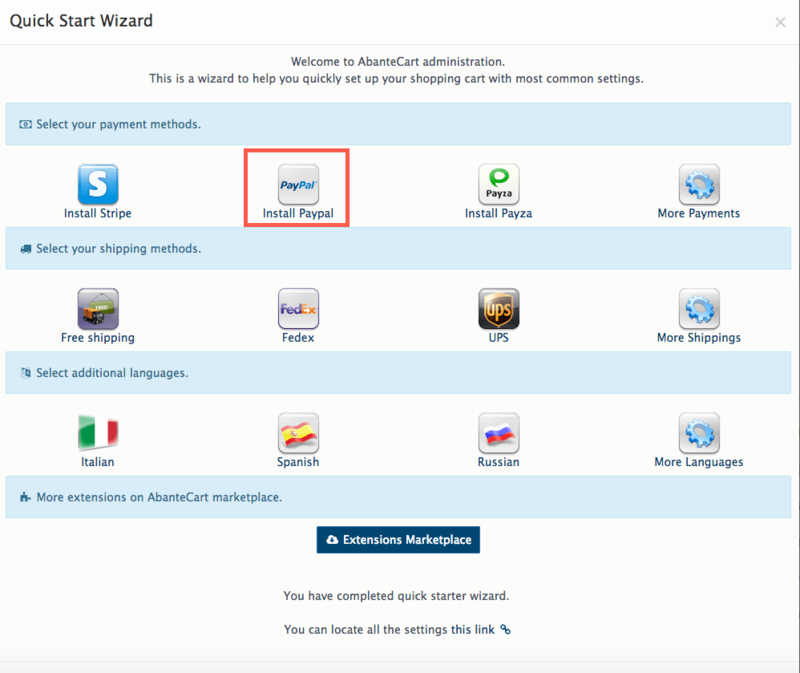 By default, the AbanteCart Quick Start Wizard installs the PayPal Payments Standard extension. 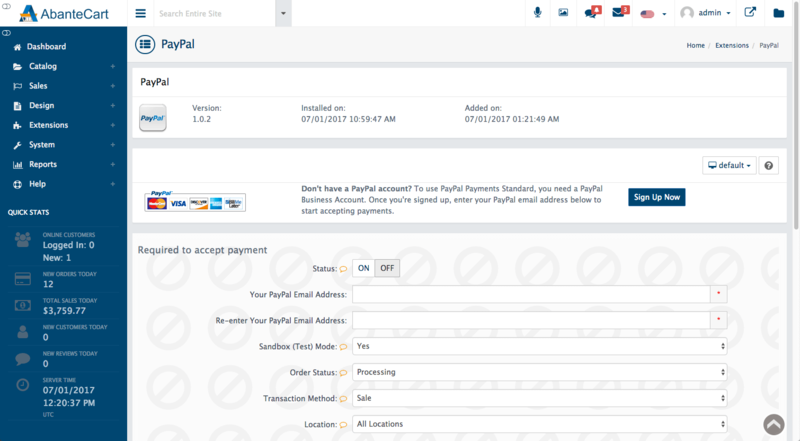 Once the PayPal Payments Standard extension has been installed, it will need to be configured with your account details. Click the Edit icon next to the extension to begin. Status: Click the On button to enable the extension. Your PayPal Email Address/Re-enter Your PayPal Email Address: Enter the email address used to create your PayPal account. Sandbox (Test) Mode: Use the dropdown menu to set the payment gateway to live or testing mode. In test mode, no payments will be taken, but the gateway will work as if it is live. Order Status: Set the default order status for new orders created using PayPal. You can select Pending, Processing or Complete. Transaction Method: Use the dropdown menu to select whether transactions are simply authorized with PayPal, or whether the funds are captured (Sale). With authorized transactions, the money is “held” for you by PayPal but you must manually accept it from within your PayPal account. With Sale transactions, the funds are debited from the customer’s account instantly and placed in your PayPal account on confirmation. Location: Use this option to restrict PayPal for use in specific regions. 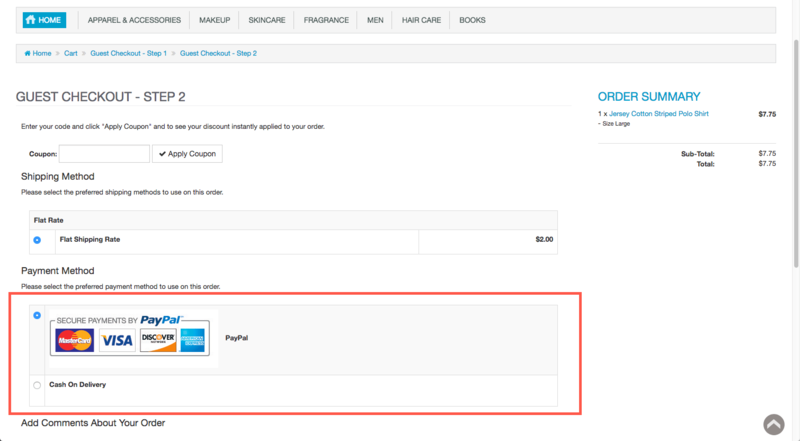 Storefront Icon: A default payment methods graphic is displayed at checkout. This can be replaced by an alternative graphic uploaded to the store. Total Order Minimum/Maximum: Enter any order value thresholds required to use PayPal. Auto Select: If PayPal is the only payment gateway used on your store, you can use this option so customers skip the gateway selection page. PayPal will be automatically selected. Run Order: If you are offering multiple payment gateways, you can change the position of PayPal in the gateway listing. Use a lower number for a higher placement in the list (1 is the highest placement). Add Company Logo: Enter a local path or URL to your company logo. 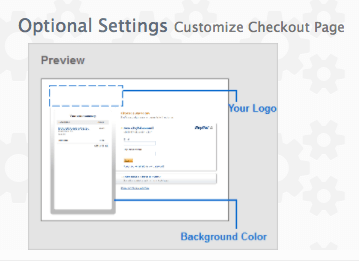 This will appear in the header of the PayPal Checkout Page, improving the consistency of the customer experience. The logo may be a JPG, PNG, or GIF up to 190 pixels wide by 60 pixels high. Enter a Background Color HEX-Code: If you wish to further tailor the PayPal checkout experience, you can add a background colour (as a hex code e.g. #0095DA) for elements of the page. Try to select a colour that is complementary with your brand identity, or simply leave blank for a white background. When you’re ready, click Save to complete configuration. Once the PayPal extension has been configured, try a test purchase to ensure the integration works correctly. 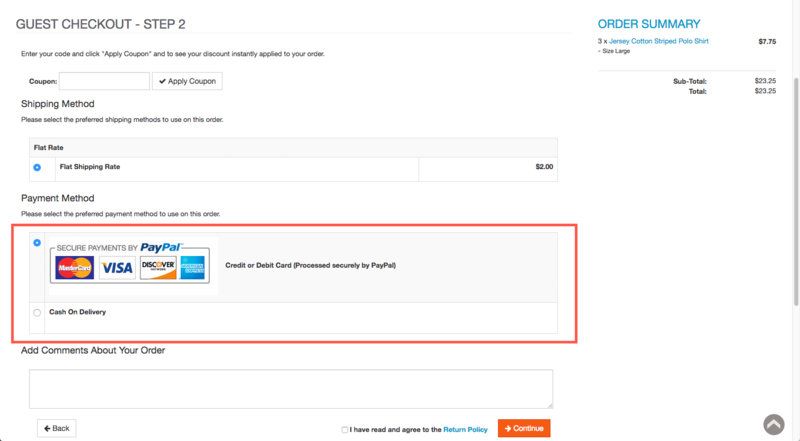 You should now see a PayPal payment option available at checkout. PayPal Payments Pro is a premium service offering additional features on top of PayPal Payments Standard, including enhanced customization options, simplified PCI compliance and deeper website integration. 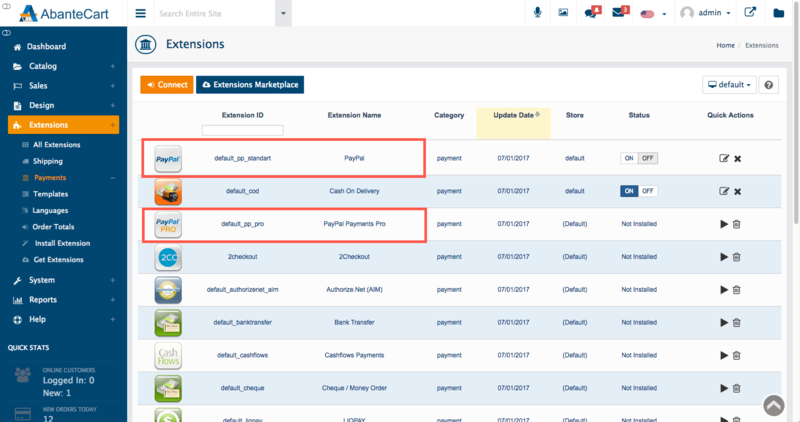 Configuring the PayPal Payments Pro extension in AbanteCart is similar to PayPal Payments Standard, but requires the use of API credentials that are supplied to you when you set up a PayPal business account. API Username: Enter your PayPal Pro API username. API Password: Enter your PayPal Pro API password. API Signature: Enter your PayPal Pro API signature. Test Your Connection: Use the Test button to test your API credentials. Sandbox (Test) Mode: If you wish to use PayPal Payments Pro in a test mode, you will need Sandbox API credentials. Click the button marked Get Your Sandbox API Credentials to request access from PayPal.Once configured, use the dropdown menu to set the payment gateway to live or testing mode. In test mode, no payments will be taken, but the gateway will work as if it is live. Accepted Credit Card Types: Check with PayPal which credit cards you can accept in your country and select from the list. Once the PayPal extension has been configured, try a test purchase to ensure the integration works correctly. With PayPal Payments Pro, all payment processing is completed on your site – there is no need for the customer to be taken to PayPal to complete their purchase. A third payment gateway option for business account holders is PayPal Express Checkout. Like PayPal Payments Pro, it uses API credentials for communication with PayPal’s servers and configuration in AbanteCart is almost identical. 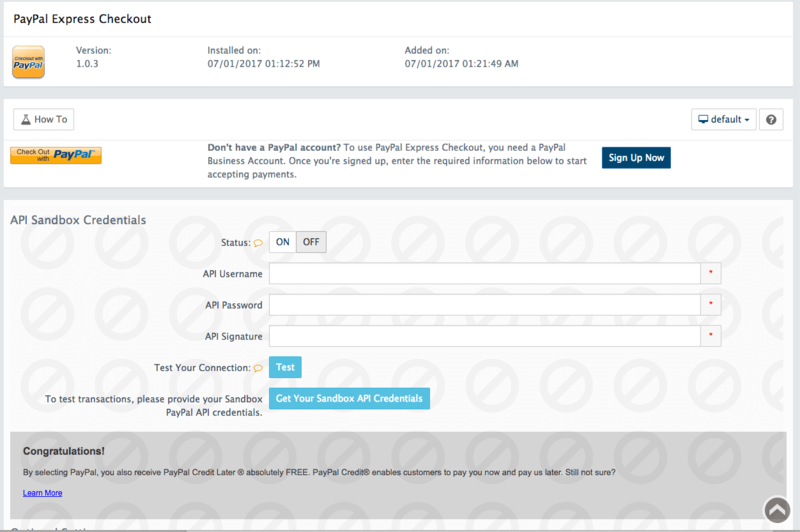 However, you will notice additional features that are exclusively available in PayPal Express Checkout that require configuration. Sandbox (Test) Mode: If you wish to use PayPal Express Checkout in a test mode, you will need Sandbox API credentials. 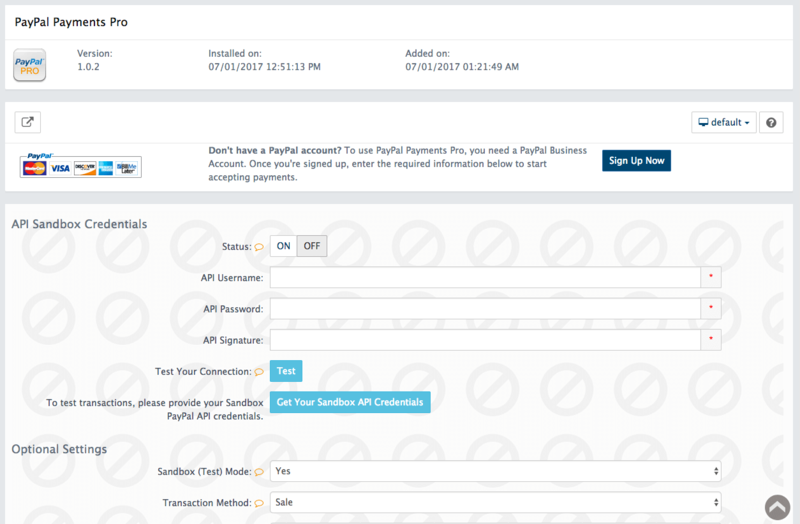 Click the button marked Get Your Sandbox API Credentials to request access from PayPal.Once configured, use the dropdown menu to set the payment gateway to live or testing mode. In test mode, no payments will be taken, but the gateway will work as if it is live. Allow Credit Cards: This option allows customers without a PayPal account to pay with a credit card. PayPal Credit (USA only): Customers in the USA can benefit from an additional finance service, supported by PayPal, when this option is enabled. PayPal Email: Enter the email address used to create your PayPal account. Auto Select: If PayPal is the only payment gateway in use on your store, you can use this option so customers skip the gateway selection page. PayPal will be automatically selected. Once the PayPal extension has been configured, try a test purchase to ensure the integration works correctly. You should now see a PayPal Checkout button appear in the Shopping Cart screen.